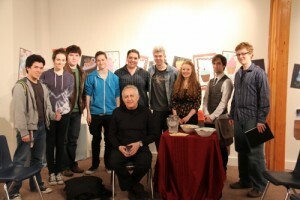 In February 2012 Bramwell Tovey was the fourth and final guest speaker in the Art Matters series at Langley Fine Arts School. Bramwell worked with the school band and orchestra, performed on piano, took a masterclass with a piano trio and spoke at length with different groups of students. Bramwell is also interviewed, discussing his own schooling and the controversy around the VSO's refusal to record music for the Vancouver Winter Olympics Opening Ceremony that would have been mimed to by another group of musicians.